anti-breakage | Relaxed. Transitioning. Natural. Beautiful. This blog post contains affiliate links (e.g., to Amazon or eBay), which means that if you click on one of the product links and place an order, I’ll receive a small commission. This helps support my blog and allows me to continue to create content like this. After shampooing and conditioning with Tension Release Hair Wash and Strength Restoring Conditioner, apply a quarter size amount of Super Softening Hair Butter to damp or dry hair. Do not rinse. Use daily or as often as needed. 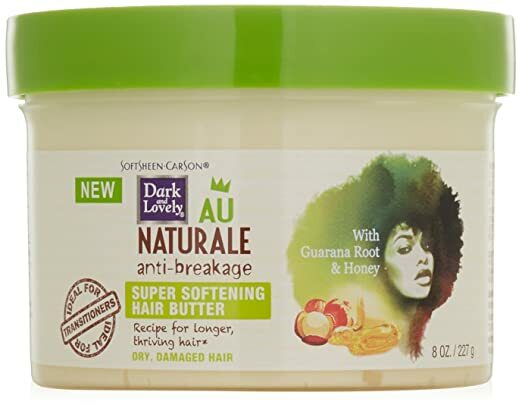 Dark & Lovely’s Super Softening Hair Butter from their anti-breakage Au Naturale line is pretty phenomenal! Even though coconut oil is the third ingredient, my hair was left soft and moisturized. I think this might be a first for me after using a commercial product with coconut oil within the first 10 ingredients! I’m kind of shocked! My biggest hurdle in my natural hair journey has been length retention and preventing split ends. I have spent most of my time either experiencing breakage or trimming off single strand knots (SSKs), mid-shaft splits, and split ends. Because the ends of our hair are the oldest part of our mane, they are quite fragile and, therefore, more prone to breakage than the rest of our hair. After using Dark & Lovely’s Root to Tip Mender with great success, I set my sights on trying their Hair Butter to develop a plan of attack against hair breakage and damage BEFORE it has a chance to even begin! It claims to reverse dry, damaged hair and transform it into moisturized strands that are supple and full of shine. This Hair Butter also promises to reconstruct damaged strands sans drying alcohols, mineral oil, parabens, or petrolatum … talk about beautiful hair without compromise! After using the Hair Butter for a few weeks now, I am quite pleased! It worked well in an uber moisturized twist-out and even gave me an angelically soft bomb wash ‘n go—no gel required! I liked this Hair Butter so much that when I saw a Dark & Lovely coupon in my Sunday paper for $2 off, I immediately purchased a second jar despite still having half of my first jar left. Dark & Lovely’s Super Softening Hair Butter has a similar fresh, clean scent as the Root to Tip Mender (except milder). The product is extremely thick and creamy. I can turn the entire jar upside down without fear of product waste. However, it doesn’t weigh down my fine hair or make it feel oily! Even after using it every day for an entire week before washing my hair, I had zero product buildup on my scalp and absolutely no residual “gunk” on my hair follicles. Honestly, this works light years better than any SheaMoisture leave-in I’ve tried, and I’ve tried quite a few! So, I have ZERO complaints. The Super Softening Hair Butter contains guarana root (aka paullinia cupana seed extract), a caffeinated berry, which helps to stimulate blood circulation in the scalp. It also contains honey, a natural humectant that helps to regulate and retain moisture in the hair. As a result, when the Hair Butter is combined with the Hair Wash and Conditioner, it will aid in preventing hair breakage so that each strand can grow healthier, stronger, and longer. Although this Hair Butter is a hair moisturizer Dark & Lovely specifically designed to quench dry, breaking transitioning hair, I find that it has worked wonders for my parched, extremely low porosity, natural hair. And, if used in an appropriate quantity, I think it would work equally well for relaxed hair, too. 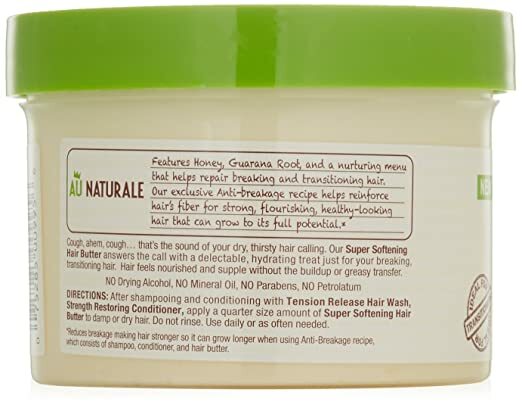 This anti-breakage Au Naturale line also has an Anti-breakage Tension Release Wash (a shampoo free of sulfates, parabens, and silicones), an Anti-breakage Strength Restoring Conditioner (a 2-in-1 rinse-out conditioner and deep conditioning treatment free of mineral oil, parabens, and petrolatum), a Length Retention Melt in Softness Detangling Co-Wash (a co-wash free of mineral oil, parabens, and petrolatum that promises to gently melt away both brittleness and tangles) , a Length Retention Inch by Inch Strengthening Balm (a product free of mineral oil, parabens, and petrolatum that rebuilds hair fibers by reinforcing weak strands from the inside out), a Length Retention Nice & Neat Braiding Custard (a styler free of mineral oil, parabens, and petrolatum that claims to keep braids looking fresher longer), and an Anti-breakage Root to Tip Mender (a hair treatment free of mineral oil, parabens, and petrolatum that resuscitates frazzled, frayed hair back to life by eradicating split ends and breakage before it has a chance to begin). Try one or all of the products … But, the Super Softening Hair Butter pairs extremely well with the Root to Tip Mender. Aqua / Water / Eau, Cetearyl Alcohol, Aminopropyl Triethoxysilane, Parfum / Fragrance, Cetyl Esters, Amodimethicone, Behentrimonium Chloride, Lactic Acid, Phenoxyethanol, Isopropyl Alcohol, Benzyl Salicylate, Hydroxypropyltrimonium Honey, Hexyl Cinnamal, Benzyl Alcohol, Trideceth-6, Linalool, Paullinia Cupana Seed Extract, Limonene, Cetrimonium Chloride, 2-Oleamido-1,3-Octadecanediol, Coumarin, Hydroxyisohexyl 3-Cyclohexene Carboxaldehyde, Geraniol, Isoeugenol, Citronellol. After shampooing and conditioning with Tension Release Hair Wash and Strength Restoring Conditioner, apply Root to Tip Mender to roots and pull through to ends. Proceed with your styling regimen. For a daily moisturizing treatment, follow up with our Super Softening Hair Butter. Dark & Lovely’s Root to Tip Mender from their anti-breakage Au Naturale line is amazing! My biggest hurdle in my natural hair journey has been length retention and preventing split ends. I have spent most of my time either experiencing breakage or trimming off single strand knots (SSKs), mid-shaft splits, and split ends. Because the ends of our hair are the oldest part of our mane, they are quite fragile and, therefore, more prone to breakage than the rest of our hair. This Root to Tip Mender promises to allow you to “skip your next snip appointment,” by preventing hair breakage and damage BEFORE it has a chance to even begin! It claims to resuscitate “frazzled, frayed hair” back to baby smooth strands. I must say the Root to Tip Mender lived up to the hype. I have been using this product for almost two months now, and since dusting my ends, I have noticed 75% fewer SSKs and split ends. Now, keep in mind, I have VERY fragile, super fine, low porosity hair that tends to become dry, frizzy, and broken at the gentlest whisper of the wind! So, this is NO small feat. In fact, I liked my Root to Tip Mender results so much that when I ran out, I purchased a pack of 4! I love the fresh, clean scent of the Root to Tip Mender. The product is light enough to moisturize my parched ends yet thick and creamy. However, it doesn’t weigh my fine hair down or make it feel greasy! Honestly, my only complaint is that it comes in such a small bottle (4 oz. to be exact). As a result, I don’t think it’s exactly conducive for “root to tip” use. If your natural hair is anything like mine, it would soak up the product in a couple of weeks if used all over your head as suggested by the moniker on the label. Instead, I use it exclusively to combat split ends and mid-shaft splits. And, so far, the Root to Tip Mender has worked wonderfully for that purpose. The Root to Tip Mender contains guarana root (aka paullinia cupana seed extract), a caffeinated berry, which helps to stimulate blood circulation in the scalp. It also contains honey, a natural humectant that helps to regulate and retain moisture in the hair. As a result, when the Root to Tip Mender is combined with the Hair Wash and Conditioner, it will aid in preventing hair breakage so that each strand can grow healthier, stronger, and longer. This anti-breakage Au Natural line also has an Anti-breakage Tension Release Wash (a shampoo free of sulfates, parabens, and silicones), an Anti-breakage Strength Restoring Conditioner (a 2-in-1 rinse-out conditioner and deep conditioning treatment free of mineral oil, parabens, and petrolatum), a Length Retention Melt in Softness Detangling Co-Wash (a co-wash free of mineral oil, parabens, and petrolatum that promises to gently melt away both brittleness and tangles) , a Length Retention Inch by Inch Strengthening Balm (a product free of mineral oil, parabens, and petrolatum that rebuilds hair fibers by reinforcing weak strands from the inside out), a Length Retention Nice & Neat Braiding Custard (a styler free of mineral oil, parabens, and petrolatum that claims to keep braids looking fresher longer), and an Anti-breakage Super Softening Hair Butter (a hair moisturizer free of alcohol, mineral oil, parabens, and petrolatum that is specifically designed to quench dry, breaking transitioning hair). Try one or all of the products … I’ve got my sights set on the Anti-breakage Super Softening Hair Butter next! HUGE Hair Announcement … The End of My Natural Hair Journey! The Inversion Method for Hair: Grow an Inch of Hair in 7 Days? Enter your email address to follow the Hair Diary blog. You will receive notifications of new posts by email.